Order the fettuccine Alfredo at Macaroni Grill and you’ll be served up a plate of 1180 calories with 73 grams of fat, 41 of it saturated fat! The same menu item at The Olive Garden will set you back 1220 calories and 75 grams of fat, 47 of those saturated. That’s more than 2 1/2 days’ worth! Here’s a much healthier version, just as delicious, that you can enjoy (almost) guilt-free! 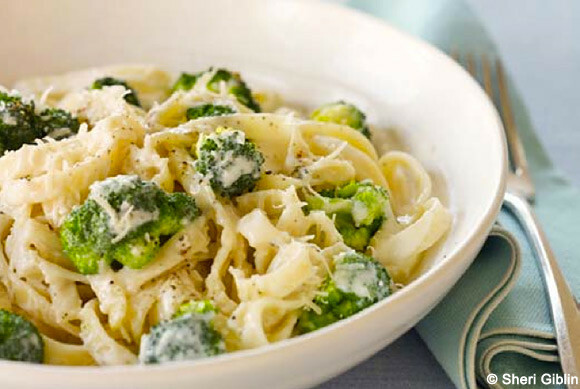 Delicious food, even those dishes only “inspired” by the Mediterranean like fettuccine Alfredo, do not have to be so unhealthy. Here’s delicious proof! My creamy white sauced pasta is only 428 calories per serving with just 9 grams of fat total, 4 grams of that saturated. 1. Bring a large pot of lightly salted water to a boil over high heat. Add the broccoli and cook until barely tender, about 5 minutes. Using a wire sieve, scoop the broccoli out of the water and transfer to a bowl. Set aside. 2. Add the pasta to the water and cook according to the package directions until al dente. 3. Meanwhile, make the sauce, which you want to be finished about the time that the pasta is cooked. Heat the oil and garlic together in a medium saucepan over medium heat just until the garlic is softened, about 1 minute. Put the flour in a bowl, and gradually whisk in the milk. Pour the milk mixture into the saucepan and bring to a simmer, whisking often. Reduce the heat to medium-low and simmer until all raw flour taste is gone, about 1 minute. Remove from the heat, add the cream and Parmigiano cheeses, and whisk until smooth. Season the sauce with the salt and pepper. 4. Drain the pasta and return to its cooking pot. Add the sauce and broccoli and mix well. Transfer to 6 pasta bowls and serve hot. I think I prefer the raw shmirp for cooking. But definitely with the tail off and already deveined I find them super yummy and they cook really fast.